According to the National Building Museum, the term “Do It Yourself” rose to popularity as a type of Home Improvement during the 1950s and 60s. As men and women returned home from the war efforts, many became interested in new products with step-by-step instructions. DIY as a hobby was born. Today, it is hard to imagine life without big-box home improvement stores on every corner. This 74.6 billion dollar industry has given rise to countless blogs, television shows, magazines and even podcasts devoted to the hobby. Doing-It-Yourself has taken hold of America’s imagination. Many of us here at A.J. Perri are also DIYers at heart. In fact, some of us first knew we wanted to work in the home trades industry while tinkering with DIY projects. We thought it would be fun to do a little digging (pun intended) into three types of DIYers: The Professional, The Weekend Warrior and The Planner. 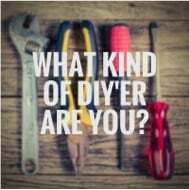 What Kind of DIY’ER are YOU? If you have ever sold a DIY project, have a workshop or dedicated workspace in your garage or have a specialized ETSY shop, you probably fall into the “Professional DIYer” category. As a ‘Professional’ people in your circle know about your passion for projects and are constantly asking you to borrow your extensive collection of power tools. We salute you for your hard work! Perhaps you should start your OWN blog?! At any rate, we think that it’s great that you like to do it yourself, but in case you are wondering, there are a few projects we think are best left to the licensed professionals. You get more projects completed around your home on the weekends than some do the entire life of their home. As a ‘Weekend Warrior,’ you may have purchased your home with weekend projects in mind. From refinishing the floors in your home to gutting and replacing your bathroom, your DIY projects lean more towards home improvement and less crafty projects. We admire your ability to tackle projects like this one over an extended holiday. Ah yes, ‘The Planner.’ We knew you would make it this far- the Planner in you loves to accumulate things. Whether it is information, craft supplies or projects, the planner in you wants to try it all! With so much passion, it can be easy to lose track of things. Keep your plans in order and finish more projects with a smart organizational system (click for more details). Want more DIY Projects for your home? Make sure to visit our blog for more ideas. If you live in our New Jersey service area and would like assistance with your home’s HVAC, Plumbing or Air Quality, please give A.J. Perri a call.